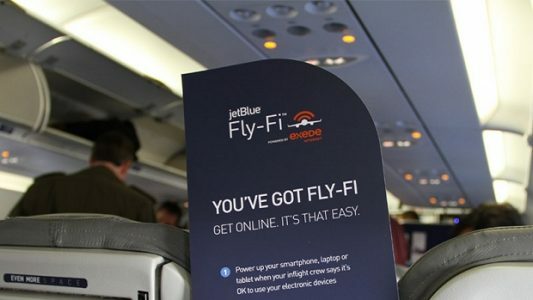 JetBlue has announced ALL domestic flights will have free WiFi. The New York City-based airline starting offering free gate-to-gate internet at the end of 2013 on one aircraft, and has now expanded the service to its entire U.S. continental fleet — 227 planes. JetBlue’s announcement makes it the first major U.S. airline to offer free internet during an entire flight on every airplane. American Airlines (AAL) offers WiFi on almost all its domestic flights, but charges customers a fee for a daily or monthly pass. A daily pass costs $16. Delta charges the same amount for a daily WiFi pass. Southwest charges $8 a day per device for internet access. Last week, Alaska Airlines (ALK), which recently acquired Virgin America, announced passengers on WiFi-enabled flights can use iMessage, WhatsApp and Facebook Messenger during a flight at no cost. (CNN).